Ever since visiting Poppie at SHE-NAIL I've been obsessed with checking the #nailart tag on Instagram. My nail polishes have been out on the side constantly, instead of hidden away in a drawer. Mum's even requested fancy digits and is currently sporting pastel ombre tips! The nail art bug has bitten hard. 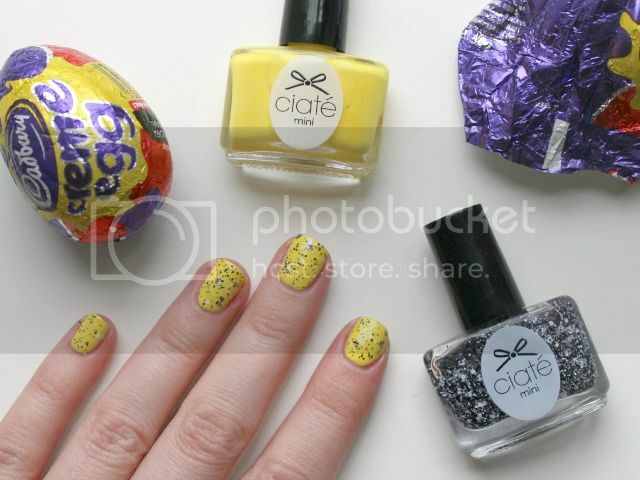 For Easter, I've sweetened my nails with a Mini Egg inspired mani. There's not much nail art going on here, but it's something that I've wanted to try for a while now. I went for a creamy yellow as a base. Ciate's Big Yellow Taxi is a beautiful shade. I've never really worn yellow on my nails before and was so surprised at how it suited my skin tone. I can see myself wearing it A LOT over summer. After two coats, I popped a layer of Ciate's Brocade Parade. I'm super pleased with how these turned out. They'd look cute with different base colours too. There's only one flaw - I now want to eat ALL the Mini Eggs! So cute! <3 Love the yellow!